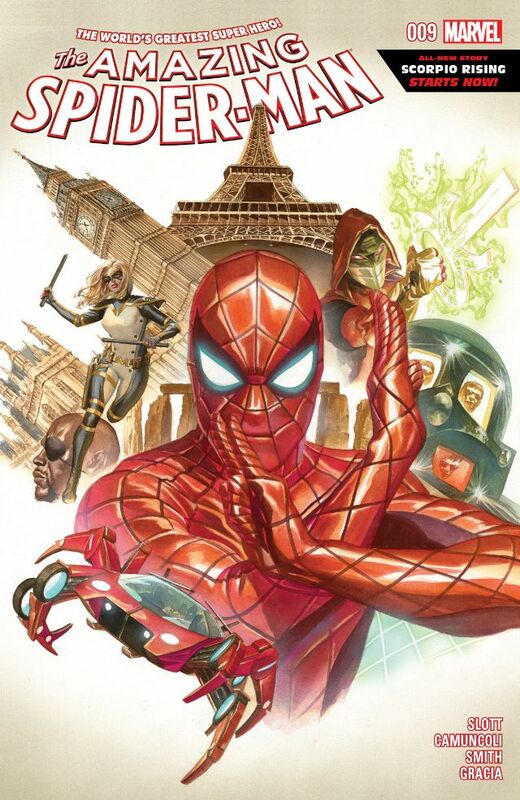 Following a mission into space with Nick Fury to regain control of the S.H.I.E.L.D satellites hacked by the terrorist organization Zodiac, Spider-Man used his emergency web-foam to make a daring free-fall from orbit to reach Paris and prevent Scorpio from gaining control of a mystical artefact – the Orrery. 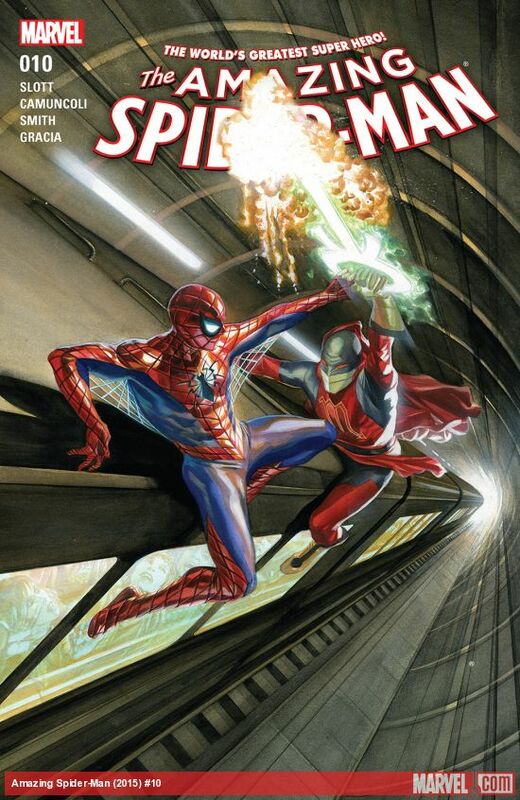 Following a ruthless attack by Scorpio, it looks like Spider-Man has lost his window of opportunity as Dan Slott propels the wall crawler’s cross-channel adventures to a whole new level, in Scorpio Rising Part 2: Power Play, as the stars align and Spider-Man’s battle with Scorpio spills over into the channel tunnel itself! This issues kicks off with Scorpio on the cusp of victory after ambushing Spider-Man in Paris following Spidey’s fiery return to Earth. But writer Dan Slott skilfully proves, perhaps here more than ever, that even without all the fancy new Parker Industries gadgets and gizmos Spidey’s great power and responsibility wins out every time! Spider-Man even manages to find a major design flaw in Scorpio’s defences, but despite his efforts, the tide of the battle shifts when Scorpio exploit’s the wall-crawlers greatest weakness. Amazing Spider-Man #10 features some truly stunning artwork from Giuseppe Camuncoli. From the exciting opening scenes, Camuncoli keeps the action flowing seamlessly across numerous locales, with a fluid page layouts packed with breathtaking levels of detail across every panel. The moment where Anna and Brain the robot arrive to give Spider-Man a lift is another highlight, as Spidey thanks the civilians who helped him, before departing with a nod to David Tennant’s 10th Doctor’s catchphrase as they set off to take the fight back to Scorpio! Of course, as you may have guessed from this issue glorious Alex Ross cover, the main battle of this issue takes place in the channel tunnel – Mission Impossible style – atop the speeding Eurostar train. This electrifying face-off between Spider-Man and Scorpio showcases Giuseppe Camuncoli’s art like never before, and Camuncoli pulls out all the stops for this fabulous, nerve jangling confrontation! Likewise, the inks by Cam Smith highlights the finer details of Camuncoli’s art, brining a real sense of speed and moment in the channel tunnel sequences, whilst inky shadows saturate the interludes during the New York jail break. The colors by Marte Gracia also shine in those aforementioned moments in Paris and the channel tunnel scenes, with vivid emerald hues crackling furiously from Scorpio’s energy attacks, to a sinister image lurking in the hazy glow of Brains robot eyes, and the opaque tones in a holographic conference call all collectively add up to make The Amazing Spider-Man #10 one hell of an impressive looking issue! Even though Spider-Man won’t be able to prevent Scorpio reaching his next stop, Spider-Man, Anna, and Brain manage to uncover a vast hidden lair, one whose secrets could see Peter Parker lose everything that he’s worked so hard to accomplish… The Amazing Spider-Man #10 is another great issue in the new Scorpio Rising arc, with Dan Slott weaving in some stellar plot twists into the mix to keep us all on our toes, and brilliant artwork by Giuseppe Camuncoli, this Spider-Man series remains one of Marvel Comics finest! 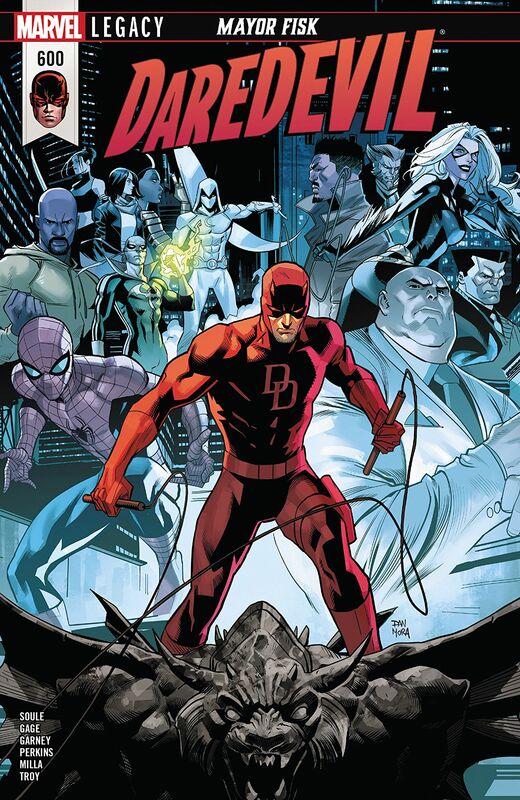 Peter Parker has discovered that an old enemy Mister Negative and his gang, the Inner Demons, have been disturbing the designer drug Shade in Shanghai. The drug warps and enhances the users’ dark side. Spider-Man’s allies Cloak and Dagger have already been affected, and have become Mister Negative’s lieutenants in his vendetta against Spider-Man. Now in The Amazing Spider-Man #8 Peter Parker and his new company are threatened by Mister Negative’s plan to invert Parker to his cause, while unknown to Peter someone inside Parker Industries has been secretly conspiring with the terrorist group ZODIAC, and now they must honour their pact and deliver what they’ve promised the organization – to kill the Amazing Spider-Man! 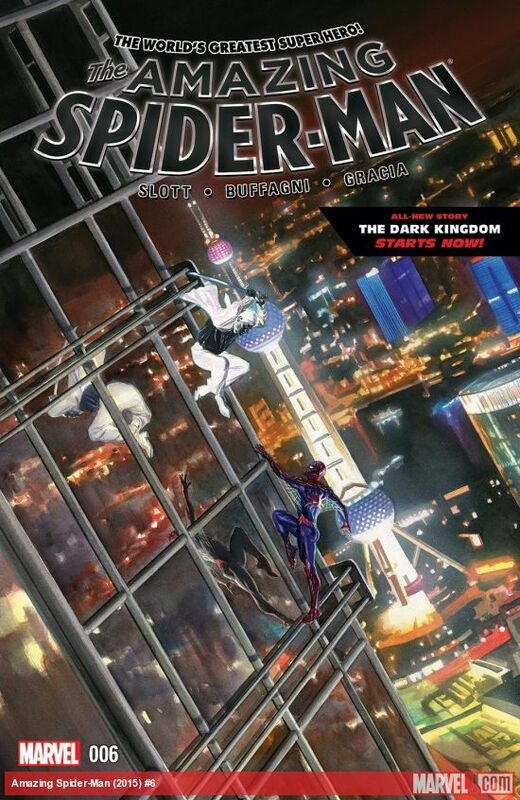 The Dark Kingdom Part 3: Black & White, concludes in Marvel’s The Amazing Spider-Man #8 as the global business world of Parker Industries, with its cutting edge high-tech innovations, collides head on with Spider-Man’s crime-fighting responsibilities to make life even more complicate for Peter Parker. Dan Slott builds the momentum right from the outset, with Dr Yao Wu quickly rustling up an antidote in his lab at Parker Industries Shanghai HQ for the officers Cloak and Dagger dosed with the Shade during their dramatic face-off with Spider-Man last issue. From here events quickly move to a presentation of an award which also happens to involve the Spider-Mobile, or more precisely the vehicles revolutionary green fuel and engines, a technology, which thanks to the funding from Shen Quinghao, will now make the new engines available nationwide. As if things aren’t hectic enough for Peter Parker, he’s also still pretending to be under Mister Negative’s influence – his corrupting touch only works once and as he already took control of Spider-Man before in the Dark Reign: Mister Negative miniseries so it won’t affect Peter now – but it’s a situation Spider-Man can use to his advantage. 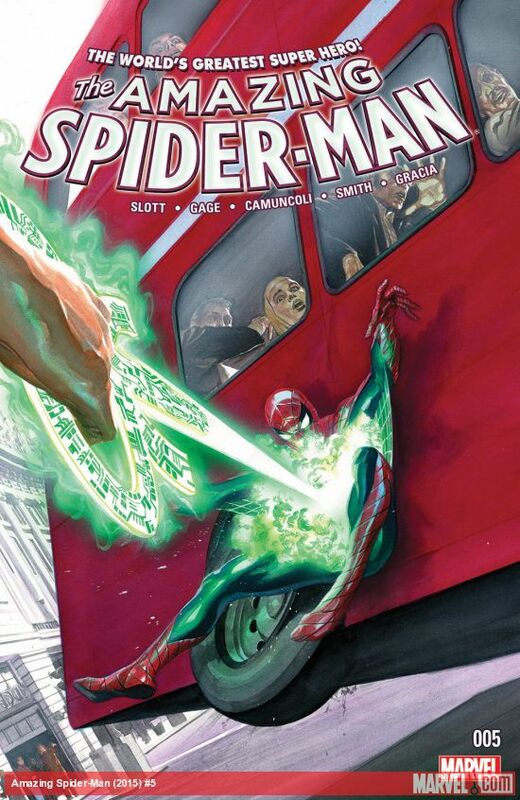 Add the fact the presentation also involves Peter taking a ride in the Spider-Mobile with his current girlfriend, Lian, who has been secretly working for ZODIAC to get experimental medical treatments for her terminally ill mother, and it’s not long before her intricate web of deceit beings to unravel. The art by Matteo Buffagnio puts the pedal to the metal, quite literally this issue, especially when the Spider-Mobile goes all Spider-Slayer when Spider-Man makes an appearance! Matteo Buffagni’s artwork really excels here, if you liked the Spider-Mobile before, you are going to go absolutely crazy for the wall crawlers not-quite-so-friendly-neighbourhood set of high-tech wheels now! Things are compounded further because Peter’s girlfriend is at the wheel, particularly when she has a crisis of conscience at a crucial moment. The action is fast and furious, as Spider-Man slugs it out with the Spider-Mobile in what quickly become a death-defying chase that plays out against the gleaming backdrop of the Shanghai skyline in spectacular fashion, and colorist Marte Gracia’s exquisite use of shade and tone ensures this is another hugely impressive issue – and of course there’s a spectacular Spider-Mobile themed cover by Alex Ross to enjoy as well! 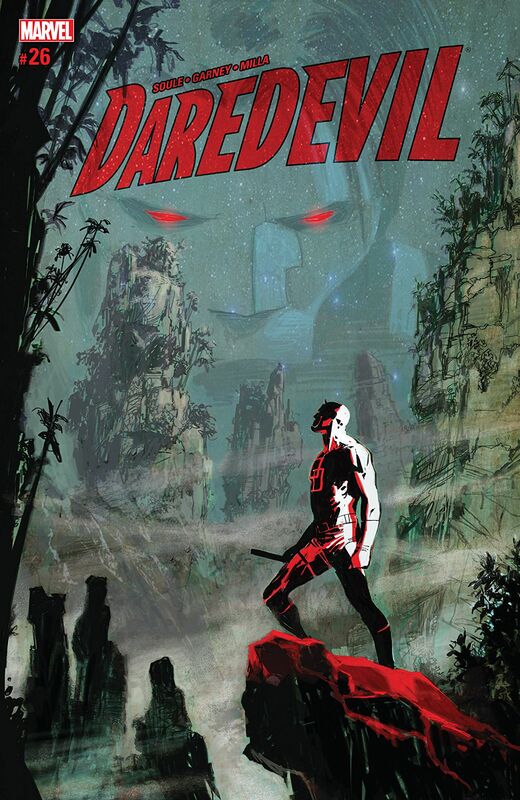 The characters and their expressions convey all the tension and drama perfectly, there are some particularly emotionally charged scenes amidst all the non-stop action as well, and Mister Negative’s grand scheme to expose Shen Quinghao’s past hit’s a snag after it becomes clear Sun’s officers are prepared to deal with the Shade. Cloak and Dagger also enter the fray once more at a pivotal moment, however this time; Spidey is ready for Cloak’s teleporting ability thanks to some nifty Parker tech. This in turn paves the way for Cloak and Dagger to eventually escape Mister Negative’s influence, it’s a moment which is of particular significance for the characters, especially for Dagger, and I like the how Cloak’s motivation to take such drastic action is cleverly juxtaposed by Lian’s reasons for selling codes to ZODIAC to get treatments for her dying mother. 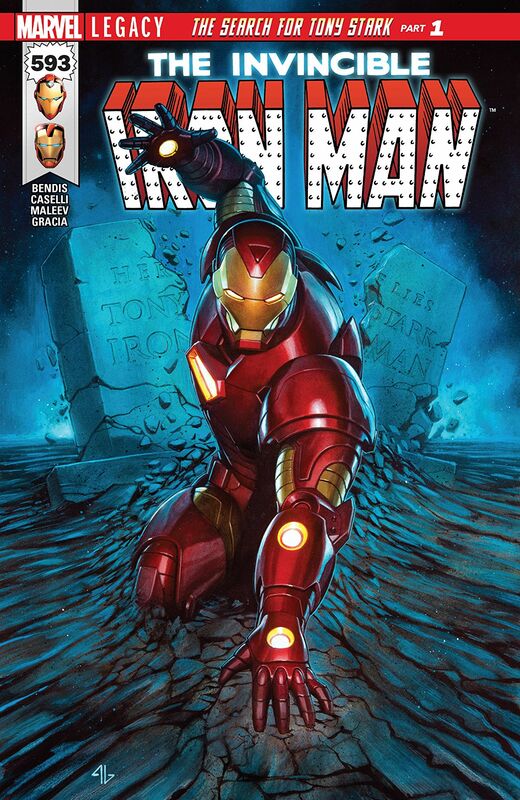 Dan Slott has crafted another superb issue here. The pace of the story seamlessly hits each emotional beat to perfection. There are some inspired moment of humour as well, including a hilarious Star Wars reference involving a certain Mon Calamari Admiral’s iconic catchphrase, there’s also gets a surprise communiqué midway thought the battle with the Spider-Mobile, and the mood set during Cloak and Dagger’s dramatically OTT closing statement is brilliantly quipped off the page by Spider-Man’s witty aside. After the build up to the climatic events in this issue, everything did seem to get wrapped up a little bit too conveniently. Mister Negative and his alter ego is still out there somewhere as well, but its good to have Cloak and Dagger back, and it will be interesting to see how Lian’s actions will impact on her relationship with Peter from this point. 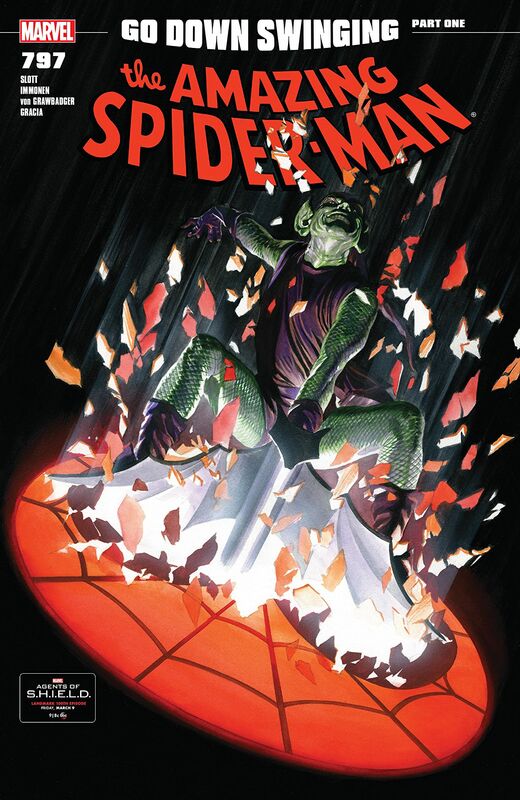 The Amazing Spider-Man #8 is an exciting and action-packed issue. Featuring a great story by Dan Slott, with excellent art by Matteo Buffagnio, and vivid colors by Marte Gracia, this is another knockout issue of Marvel’s flagship Spider-Man title, and everything is now set for the new story arc Scorpio Rising beginning in March! A new story-arc begins: The Dark Kingdom! Peter Parker’s company Parker Industries is brining cutting edge high-tech to the world, it also equips S.H.I.E.L.D, and the Uncle Ben Foundation offers humanitarian aid all over the world. Following the battle with Zodiac and Scorpio in the UK, The Amazing Spider-Man #6 finds Peter Parker back in Shanghai, where one of Spider-Man’s deadliest villains has returned: Mister Negative! What is Mister Negative’s plan, and how has he got two fan-favourite Marvel heroes to join forces with him? Its another busy day at Parker Industries filled with plenty of new innovations and action-packed web-spinning for Peter Parker in Marvel’s The Amazing Spider-Man #6, where, following a flashback to a well organised breakout of a high security prisoner on Stronghold 1: the department of justice prison transport, writer Dan Slott kicks off the story in earnest as we find Peter enjoying a brief respite from his executive role and wall crawling duties on the rooftop of the Shanghai branch of Parker Industries. After a quick Spider-Sense tingling white-knuckle ride in the Spider-Mobile, things get a little more complicated for Peter, as business and politics become awkwardly entwined, before news of the arrival of Mister Negative means its time for some Spidey action! This issue covers a lot of ground in a short space of time, but it doesn’t feel rushed though. The opening flashback is handled really well, it’s a good way to reintroduce Mister Negative, and the surprise of having him teamed up with Cloak and Dagger is another neat twist – especially with the unexpected role reversal of their powers. Matteo Buffagni’s art is also very good, each scene is well presented, the characters are all nicely defined, and the page layouts stylishly convey the fast-paced action. Mister Negative is also an intersting villain, its great to see him return, and his powers certainly makes him one of Spider-Man’s more unusual adversaries. I like the contrast Buffagni’s art highlights between Peter’s high-flying business life and his wall crawling adventures as Spider-Man. There’s some awesome Spider-Mobile action as well, I love that car, it always looks stunning, and that wrecking ball scene is sure to leave you with a big silly grin on your face! I’m also really pleased to see the return of Cloak and Dagger in this issue of The Amazing Spider-Man. Dan Slott has really brought a new spin on the characters here, especially how their powers have now been drastically altered by Mister Negative. 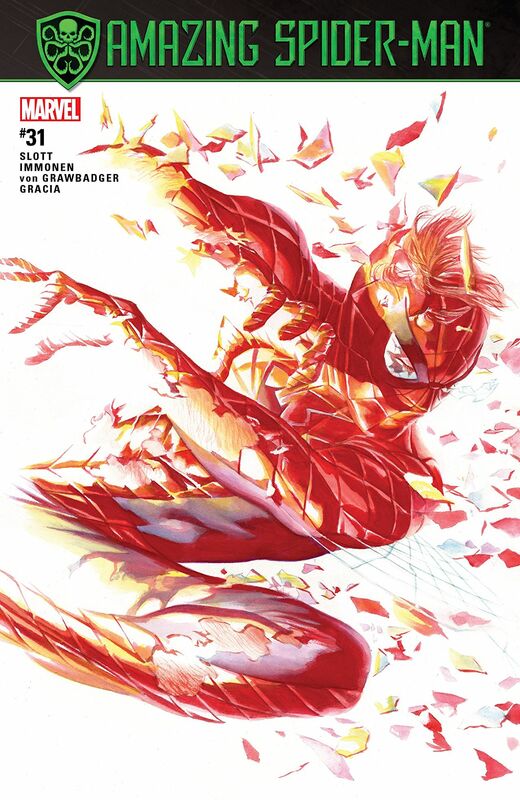 The artwork of Matteo Buffagni really captures the essence of these characters perfectly, they dominate every scene they appear in, and colorist Marte Gracia employs subtle shades and tones to great effect throughout to make this one of the most impressive looking issues of the new series so far – and let’s not forget that gorgeous cover by Alex Ross as well, this one’s a real stunner! Amazing Spider-Man #6 gets The Dark Kingdom arc off to a great start. 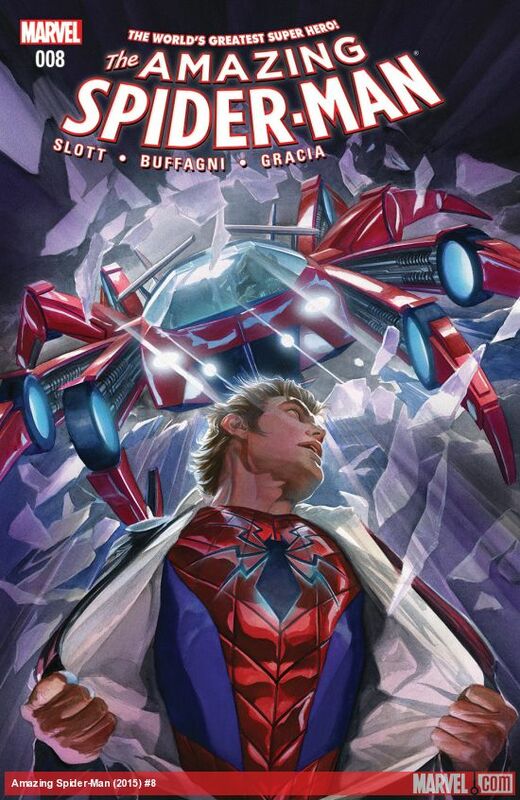 Dan Slott is on great form once again, his writing always seems to draw me into the story, and he has a great handle on all the characters, which together with Matteo Buffagni’s art and Marte Gracia’s colors, makes this another standout issue. I’m really looking forward to seeing how this story develops, especially after that cliff-hanger ending, and to finding out exactly how and why Cloak and Dagger are now working for Mister Negative.